CamaroNews reports Scott Settlemire, colloquially known as the “FbodFather”, held his official retirement party and Chief Camaro Engineer, Al Oppenheiser, and posse decided to show up in a handful of 2016 Chevrolet Camaro samplings. Oppenheiser’s happened to be sporting the newly named glow-tie emblem, which he tweeted about days earlier. 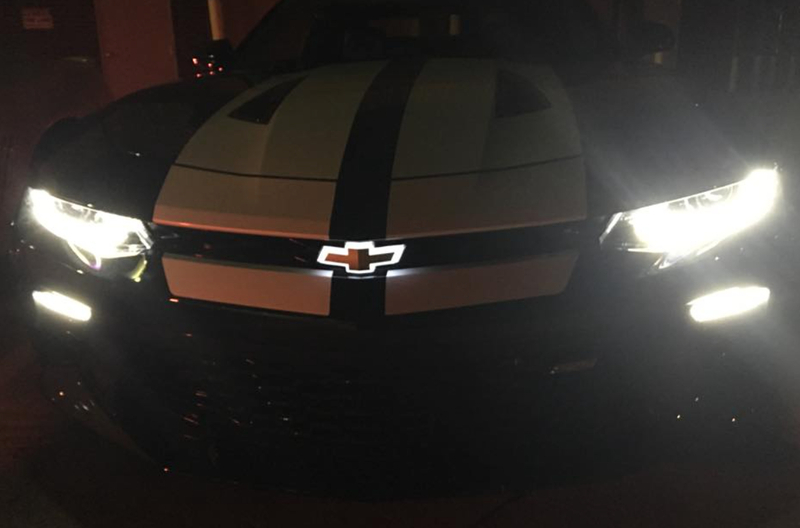 The classic Chevrolet bowtie is simply illuminated with lighting to make the car’s presence known even after the sun goes down. To us, it seems a full frontal view is the best way to see the emblem, but we’re sure there are more than a few who feel is may be a tad too gimmicky for their tastes. We’ll sit on the fence as indifferent on this one. I agree, this looks pretty awesome! It won’t be for everyone, but this gives a little more pizzazz to the car (as if it needed any more). If this is really an option, I have a feeling it will be a popular one. Maybe someone will turn the glow-tie into a flow-glow-tie. A lot of 5th Gen owners bought the light up bow ties as an aftermarket part. Might as well get it as a factory installed option if it’s available. I like that GM paid attention to what current owners have been doing in the aftermarket parts world and brought OEM options to cover some of those things. I just recieved them in stock and posted to our ebay store.